The replacement of Iran's chief nuclear negotiator is part of a Tehran power-play that is more troubling for Mahmoud Ahmadinejad than it appears, says Nasrin Alavi. A surprise announcement on 20 October 2007 is generating fresh questions about Iran's strategic policy and ambitions. The resignation of Iran's chief nuclear negotiator Ali Larijani from this position is both a signal of tensions inside Iran's complex, multi-layered power-network, and the withdrawal of a figure who acted as a rational interlocutor with the International Atomic Energy Agency (IAEA) and western governments. In a jittery climate where Washington is heightening its rhetoric in a manner reminiscent of the pre-Iraq-war period, Larijani's move is more likely to reinforce than to moderate current dangers. The news has been met with some dismay even by conservative figures inside Iran; on 22 October, 183 mostly conservative members of the majlis (parliament) affirmed their support for Larijani. Ali Akbar Velayati, former foreign minister and international-affairs adviser to Iran's supreme leader Ayatollah Ali Khamenei, commented that "it was best if this hadn't happened." 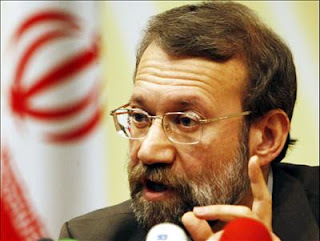 The first deputy speaker of the majlis (parliament) Mohammad Reza Bahonar told reporters on 21 October that there were "deep-rooted problems" between Larijani and Iran's president, Mahmoud Ahmadinejad, that "could not be solved". Such differences were exposed in the varying reactions to Vladimir Putin's proposal on the nuclear stand-off made on 16 October, during the Russian president's visit to Iran; while Larijani acknowledged that Tehran was considering Putin's offer to Iran's supreme leader Ayatollah Ali Khamenei (who himself said it was "ponderable"), the spokesman for Ahmadinejad's government denied the existence of any such proposal or the possibility of a compromise deal. Bahonar, a hardline conservative, also raised questions about the credentials of Larijani's replacement, Saeed Jalili; "can someone who is not even a member of the supreme national security council be appointed as its secretary?" The 42-year-old Jalili is one of Ahmadinejad's chief advisors, one of a growing number of Ahmadinejad clones that seem to have appeared from the Iranian political wilderness since the president's election in 2005; his decade of uninspiring service in the foreign office had culminated in the post of deputy foreign minister for European and American affairs, where he is credited with orchestrating Iran's closer "south-south" relationship with Latin American states (particularly Hugo Chávez's Venezuela). In the west, Larijani is often described as a pragmatic conservative. He had long been critical of the government's handling of Iranian nuclear negotiations under the reformist presidency of Mohammad Khatami (1997-2005), and his appointment in 2005 to head the supreme national security council was at the time generally seen as a toughening of Iran's stand on the nuclear issue. Yet with the election of Ahmadinejad, figures such as Larijani - who had stood against Ahmadinejad in the election - came increasingly to be viewed as doves. Ali Abtahi, Iran's deputy president under Khatami, described Larijani's resignation as "dangerous" and recalled his description of Iran's agreed suspension of its uranium-enrichment programme in 2004 as akin to "a precious pearl in return for a sweet". Why cannot Larijani "carry on with his work", Abtahi asked. President Ahmadinejad's posse was in full view during his visit to New York in September 2007 for the opening of the United Nations general assembly (and his speech at Columbia University). In addition to Jalili himself were the government spokesman Gholam-Hossein Elham (whose wife has penned a book calling Ahmadinejad "the miracle of the third millennium") and another powerful presidential advisor, Mojtaba Hashemi-Samareh. In a political system where sycophancy is equated with good manners, the camera invariably spies Samareh's habit of physically fawning at the end of each presidential utterance. All the president's men are tightly bonded by their allegiance to Ahmadinejad's spiritual adviser, Ayatollah Mohammad-Taqi Mesbah-Yazdi. Saeed Jalili was asked in March 2007 by a Fars news-agency journalist whether he was Ahmadinejad's "direct representative in the foreign ministry" and whether he has "provided the president with many of his foreign-policy ideas". Jalili responded that he was merely one of many advisors to the president. He denied having masterminded Ahmadinejad's questioning of the Nazi holocaust or his spasm of letter-writing to President Bush (he elaborated: "perhaps as we think alike and we go back a long way, some may be under this impression". But resistance to Jalili's appointment is widely shared; several prominent conservatives regard the new chief nuclear negotiator as lacking pedigree and experience. Ahmad Tavakkoli, director of the influential "parliamentary strategic research centre" has previously backed some of the presidents' policies; this time, he expressed disappointment at the resignation of Larijani, whose political stature is far greater than the "inexperienced ex-foreign minister" who replaces him. These critical murmurings are part of a rising chorus of antagonism from powerful conservatives and reformists alike towards the president and his coterie for their bungling economic policies at home and aggressive policies abroad. In 2005, Jalili may well have been Ahmadinejad's initial choice for foreign minister; but the opposition the new president soon faced in installing candidates for his cabinet (an oil minister was sworn in after a three-month parliamentary deadlock, including three failed attempts to secure a vote of confidence) was always likely to touch the inexperienced Jalili. The post-election confusion ended with a political bargain when Manouchehr Mottaki (who had campaigned for Ali Larijani in the presidential race) was appointed foreign minister. Larijani, even after his resignation, still holds the important position of Ayatollah Khamenei's representative in the national security council; in this capacity, he is accompanying Jalili to scheduled talks with the European Union's foreign-policy chief, Javier Solana, in Rome on 23 October; his deputy and right-hand man Javad Vaeedi will also be there, and Larijani's close alliance with Mottaki survives. It remains to be seen whether these personnel shifts will be reflected in a policy reversal, or whether Iran will continue to follow the "work plan" proposed by the IAEA to settle the unresolved questions over its Iran's nuclear activities. Saeed Jalili responded sharply to the Fars journalist who questioned the possible "costs" of Iran's foreign policy by asking "what costs? Today even westerners say that Iran is more powerful than ever before". In reality, any "success" that Ahmadinejad has enjoyed owes less to his government's cunning foreign strategies and more to the United States's strategic ineptitude in the region. Yet Ahmadinejad is adept on a rhetorical level: he has used an aggressive US stance to his advantage by portraying his government and its Revolutionary Guard partners as the only entity inside Iran willing and able to stand up to an America bent on the regime's destruction, and for which the nuclear issue is only a pretext. At the same time, it cannot be said that Larijani's departure means that Ahmadinejad has taken over the nuclear programme and Iran's nuclear-related dealings with the west; for other powerful figures within Iran's circles of power, including Larijani himself and his foreign-office allies, are still in the picture. What can be said with certainty is that Ahmadinejad is doing his best to consolidate his power within the system. Whether he succeeds depends partly on the internal dynamics inside Iran and partly on the mounting external pressures that to date have helped only to empower him. Nasrin Alavi is the author of We Are Iran: The Persian Blogs (Portobello Books, 2005). She spent her formative years in Iran, attended university in Britain and worked in London, and then returned to her birthplace to work for an NGO for a number of years. Today she lives in Britain.